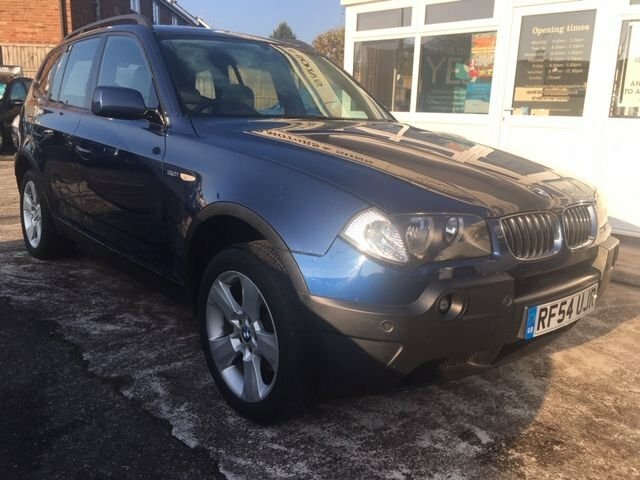 This 2005 BMW X3 with Intelligent 4 Wheel Drive is the highly desirable 3.0 Sport Automatic variant - Finished in Tahiti Blue Metallic and Light Grey Full Leather Interior making it the best colour combination!! Sold and Serviced by ourselves previously it also features Cruise Control, Hands Free Phone Prep, Business Edition Audio, Front and Rear Parking Sensors, Tow Pack, Roof Rails, Alloy Wheels, Electriuc Windows, Electric Mirrors etc - First to drive will buy at this price!!! The pioneer of the Sports Activity Vehicle class, the BMW X3 has continued to push boundaries. A true all-rounder, it offers sweeping exterior contours matched by a refined and spacious cabin. The interior is equipped with a host of innovative technology features, while the ride itself is responsive and enormous fun. Take a closer look at the range of used BMW X3 models for sale in Worcester right here at BJH Motors and Sons. We're a leading supplier of used cars in Worcester and you can rest assured that we'll do everything possible to help you find the right vehicle to suit your budget and lifestyle. Contact a member of the team now to find out more.